Finding a good izakaya with a good nihonshu list on Sundays presents a bit of a challenge because a lot of places are closed on the weekend, especially those in the central Tokyo business area. Rather than trying to search for a new place on Sundays, I start with Nozaki Saketen for a reservation. Last night, a bunch of us sake fans from around the globe went out and had plenty of nihonshu and typical izakaya food. 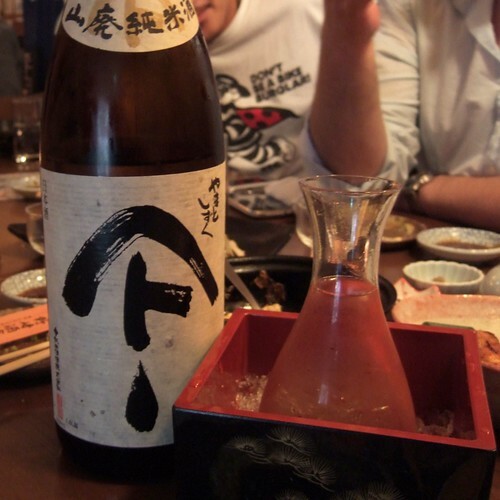 The last sake recommended by the restaurant was this bottle, Yamato Shizuku Yamahai Junmai brewed by Akita Seishu. The recommendation came after starting the night with summery sake from Tsuji Zenbee, Raifuku, and Mizubasho. Then we went on full bodied Akita streak with Ippaku Suisei and Mansaku-no-Hana. For Akita sake fans, Kariho or Dewatsuru should sound familiar. Yamato Shizuku is the third brand from the same company, Akita Seishu, and it is dedicated to their original yago or brand name and logo from Edo period. Actually, Nozaki Sakaten is a great lively, casual, and reasonably-priced place to sip from a good selection of sake any day of the week, but if you are at a loss on Sundays, try calling them first! A few minutes walk from JR Shinbashi Station Karasumori exit. Map and Directions: Please see this Japan Times article for directions.